A very special book from a distinguished and respected writer, L G Warburton. 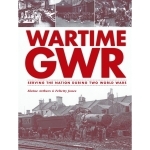 WARTIME LMS takes the story of the company from the build up and preparation to WW2, through the days of conflict and back to the difficult times that followed. This is a learned tome, well illustrated of course, but one where the text carries the true story of each department of the railway including the men in charge of each, and how they prepared for and dealt with the running of the railway during the period. Illustrated with contemporary material including fold out maps contained within a pocket at the rear. Casebound, 184 pages plus index.